Zeitgeist release documentary Harlan — In the Shadow of Jew Suss on DVD on Nov. 23, 2010. 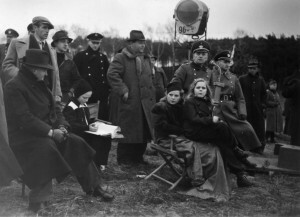 The film about the notorious Nazi Germany filmmaker Veit Harlan and his horrific 1940 anti-Semitic propaganda film Jew Süss carried a suggested retail price of $29.99. Millions across occupied Europe saw Harlan’s films, the most infamous of which, Jew Süss, was required viewing for all SS members. An unrepentant and blindly obsessive craftsman, no figure — save for Leni Riefenstahl — Harlan is as closely associated with Third Reich cinema as Joseph Goebbels’ top director. Harlan also was the only Nazi-era artist to be charged with war crimes. Harlan’s own shadow also looms over modern cinema. He had familial ties to Stanley Kubrick: Kubrick’s wife, actress Christiane Kubrick (Paths of Glory), and his brother-in-law and longtime producer Jan Harlan (The Shining, Eyes Wide Shut) are Harlan’s niece and nephew. And in his sprawling 2009 World War II extravaganza Inglourious Basterds, Quentin Tarantino used Harlan’s 1945 epic Kolberg as the basis for Basterds’ pivotal film-within-a-film Stolz der Nation. Released theatrically to critical acclaim in the top 25 U.S. markets, Harlan – In the Shadow of Jew Süss offers an eye-opening examination of World War II film history, while also showing how Harlan’s descendants struggle with the dark myth of his artistic immorality. Q&A with Veit Harlan’s granddaughter, journalist and critic Jessica Jacoby. and video interview with acclaimed German filmmaker Alexander Kluge (Yesterday Girl) about Harlan’s film career.